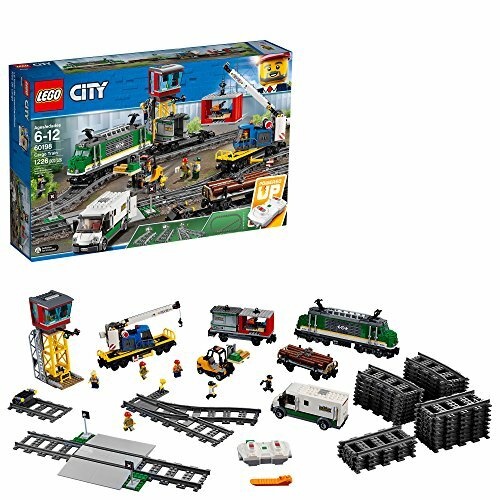 LEGO City Cargo Train Building Kit (1226 Piece) — Deals from SaveaLoonie! All aboard the cargo train! Kids can be conductors with this motorized remote control train and tracks set. The best gift for boys and girls who love construction sets! Includes 1226 LEGO pieces that assemble into a cargo train with 4 cars, a control center, an armored truck, a forklift, and rail tracks. For boys and girls age 6-12 who want to operate their own electronic locomotive. Build your own runaway train story with a 10-speed Bluetooth remote control to operate the battery-powered railway as well as 6 minifigures: 4 train workers, a security officer, and a crook. Batteries not included.